The "official" name of the German National Anthem is Das Lied der Deutschen,or simply, Das Deutschlandlied. The song is often called Deutschland ueber Alles,simply because those are the opening words of the first stanza. It is virtually unknown today that the expression "über alles", or "before all [others]" refers not to the conquest or enslavement of other countries or the establishment of German hegemony over other peoples, but rather to a call for all Germans to abandon their concept of being a subject or citizen of this or that principality or region (such as Bavaria or Prussia) and to realize the common bond they had with one another by simply being German. This concept was considered "revolutionary" at the time the words were written in 1841, since loyalty to "Germany" was considered by the princelings and kings of the disunited Reich (divided into 40-plus separate states) to be disloyalty to themselves.This "All-German" idea was suspect because it was also associated with the rising middle classes and their suppressed Frankfurt assembly of 1848. The song's words were penned by the teacher Heinrich Hoffmann von Fallersleben, who had been a fervent supporter of German unity and republican government, and who, because of his activities on behalf of these causes, was forced to flee to the North Sea island of Heligoland, where the verses were actually written. The music is taken from the String Quartet in C major (the Kaiser-Quartet), Op. 76,3 of Joseph Haydn, composed in 1797. It was officially ignored during most of the Second Reich (1871 to 1918), which had no official anthem as such. The Deutschlandlied's real popularity began with World War I, when it was sung on the battlefield by young soldiers from every Gau of the Reich who were thrown together against a common foe. 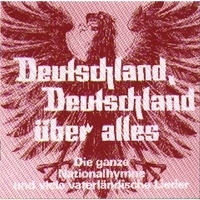 Ironically, Das Deutschlandlied did not become the official national anthem until declared so by President Ebert of the Weimar Republic in March, 1922. Not surprisingly, during the next European War, the words "über Alles" were ruthlessly exploited by Allied propagandists. Banned after 1945 by the victors, the Deutschlandlied is again the German national anthem, but only the third stanza is used. The first stanza is absolutely verboten, since it refers to the traditional ethnographic boundaries of Germany ("from the Maas [in Belgium] to the Memel [between the present day Kaliningrad area of Russia and Lithuania], from the Etsch [on the Austro-Italian border] to the Belt [in Denmark]"). Likewise, the propagandistic mistranslation of the words "über alles" has now become accepted "truth", thus precluding their use. After the fall of the Berlin Wall, proposals were made to combine the hymns of the BRD and the DDR (the anthem of which was an officially commissioned postwar piece by the communist poet Johannes R. Becher and leftist composer Hans Eisler) to create a "unified" national anthem. At that point, musicologists made the ironic discovery that, in terms of rhythm and meter, the words of the former DDR' s anthem Auferstanden aus Ruinen (perhaps not accidentally) fit the musical score of the Das Deutschlandlied perfectly! Click the CD Image to buy it! Copyright © 1996-2014 Brandenburg Historica LLC. All Rights Reserved.